If you’ve been to the leasing office in the past couple of weeks you may have noticed a new face. We’re excited to welcome the new property manager, Michele West. 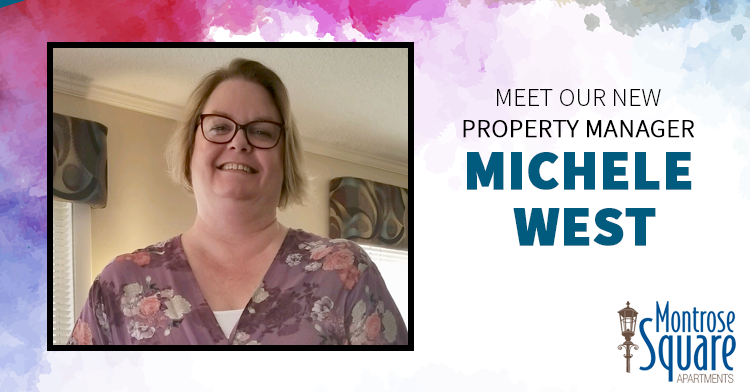 As the property manager, Michele will help address any resident issues and make sure that our community is well maintained and a great place to live. Michele has been in the apartment industry for over 21 years and is excited to bring her experience to Montrose Square and to get to know our residents. I was raised in Fort Wayne and attended St. Peter’s, Blackhawk Middle School, and Snider High School. I graduated with my bachelor’s degree in Accounting from the University of Akron. I left Fort Wayne and moved around the country with my family. We have lived in Indiana, Alabama, Texas, New York, New Jersey, and Ohio. I have 3 children — 2 daughters and 1 son as well as 4 grandchildren that live in Ohio. In 2010 I moved back to Fort Wayne to be closer to my family. Molly Weasley. She had a large family that would do anything for each other and being a witch with the ability to clean up with a flick of a wand is not bad either. If you were stranded on a desert island, what one item would you want with you? Some kind of nut plant that I could grow nuts to make sure I could eat. What is the happiest moment that you’ve experienced in your life? Please join us in welcoming Michele to the Montrose Square Apartments team! It might be a little cool to switch over your wardrobe to your spring clothes, but there’s nothing stopping you from putting up your favorite spring decor. The way your home looks can have a huge impact on your mood. Let go of the drab colors of winter and liven things up with bright spring hues. Make a day of it and invited some friends over. Read on for tips and tricks to get started. Your home is a wild ecosystem full of bacteria and other potential threats. Throws and blankets that are left out all year long can carry bacteria that could cause illness. It’s important to wash your throws and blankets often. But also, consider changing them out periodically. Changing every season also allows you to get a blanket that is the perfect weight so you’ll never be too hot or too cold. Spring is the season of renewal and one of the most beautiful places that is represented is in nature with the blossoming of flowers. Why not bring some of those beautiful blooms indoors to brighten up your space? Or, purchase some succulents for your home if you want something more easy to grow. When you think of spring, you think of fresh air, clean linens, and a refreshing breeze. To create an air of spring in your home, you will need to invest in candles or essential oils that carry a bouquet of spring fragrance. You can also buy lightweight curtains and rugs to make the space feel fresher. It’s time to go shopping for some fun throw rugs. Spring is a time for downsizing, decluttering and organization. After a long winter, it’s time to get rid of all of the stuff exploding out of your closets. Start by getting rid of all of the winter clothes you didn’t wear that year. If you didn’t find time to wear it all season, it’s not likely that you will wear it next year. Spring is all about bright, sunny colors. Think about your home’s color palette and what colors would mix in well. You don’t have to go as far as painting a wall to add in an accent color. Even small choices like adding a colorful bowl of fruit can make a huge difference in the feel of your home. Or you could purchase and refinish a small table in a fun color to brighten up your space without spending a lot of money. Put a few photos on top of it and you have a fun spring display. Decorating your place with spring decor is a great way to welcome the season. But if you’re stuck in a drab apartment with low light, it’s hard to create the air and energy of spring. Check out our blog for more helpful articles. And if you’re looking for an apartment in the Fort Wayne area, check out some of our listings of bright spaces you could call home. Over 43 million households are renter occupied. Many renters don’t personalize their living space for fear they’ll damage the walls. If you’re a renter, take heart. You can decorate damage free! All you need are Command damage-free hooks. Command hooks are also great space savers. They’ll make your apartment tidy and efficient. Live in style with these Command hook hacks. And no more worries about damaging the walls. Many apartments are short on kitchen counter space. If that’s true for your kitchen, try this easy hack. Use various-size Command hooks. Hang pans, strainers, and other cooking tools on the wall. It works even if the walls are tiled. And don’t waste the space on the inside of the cabinet doors. Hang small hooks for measuring spoons and mixer attachments. Get creative for extra kitchen storage space. If you’re in an apartment, you might not have a dedicated office or craft room. No problem! Carve out a small work area using Command hooks. Keep your smartphone in a clear Command caddy. Use another clear caddy for paperclips, pens, pencils, and rubber bands. Place two hooks with a dowel between them. Slide wrapping paper onto the dowel. Hang tape and scissors from the wall. Using the walls saves floor and closet space and makes your room versatile. There’s a Command hook for almost everything, including your hair dryer. If you need help in your tub, there are hooks with weight capacity up to 5 pounds. Many apartment showers and tubs are small with nowhere to set your stuff except the floor. That makes cleaning a pain. But Command hooks work even in wet environments. Get your soap and other shower products off the floor. Command hooks stick to tile, fiberglass, and painted surfaces. Use small hooks and turn them sideways on the inside of the sink cabinet door. Now you’ve got the perfect toothbrush holders. This keeps your toothbrushes clean and out of the way. Not sure what to do with all those necklaces and earrings? Use Command hooks! You’ll get a two-for-one hack when you hang your jewelry. No more tangled necklaces, and you get beautiful wall decor. Do you have a gorgeous scarf collection? Place two hooks with a dowel between them. Hang your scarves on the dowel. This saves you closet space and looks great on the wall. Have a small entryway with no floor space? Use the walls without worry. Combine function and beauty using damage-free hooks. Use Command picture-hanging hooks and hang your favorite poster or photo. Add a key rail so you’ll never lose your keys again. Throw in a picture ledge for mail and a small art piece. And of course, don’t forget some large hooks for scarves, hats, and jackets. Maximize space and show your style with these great Command hook hacks. You’ll have peace of mind knowing you’ve got your leasing office’s approval. No more worrying about damaged walls and unreturned security deposits. Best of all, it’s easy and fun. Don’t live in a bland space. Express yourself! Are you looking for a great new apartment? Find one here. The average Hoosier’s electric bill is $115 monthly. Indiana residents have the 22nd highest electric bills. While it could be worse, think of all the extra money you could have in your wallet with a smaller electric bill. Now that we’re in the thick of winter, don’t blow all your money trying to heat your home. Check out these tips to lower your electric bill this winter. Renting an apartment is affordable, especially if you implement winter energy saving tips. One of the best tips to save money is insulating your apartment’s doors and windows. For your main apartment door, invest in a door sweep or install a door draft stopper. These items prevent cold air from entering your apartment through any gaps in your door frame. If your apartment windows tend to let in cool air, insulate them with plastic coverings. If you don’t want to take the plastic route, heavy curtains can help block cold air. Wondering how to lower electric bill in winter? It’s as simple as lowering your thermostat. You can save up to 10 percent on your electricity bills by lowering your thermostat by a few degrees when you are at work or sleeping. When you aren’t home, there’s no need to heat an empty apartment. When you do come home to your apartment, challenge yourself to keep the temperature lower than you usually would. Instead, layer up your clothing and use an extra blanket. Your budget will thank you for your sacrifice. One solution to how to save on heating bills is to reverse your ceiling fans. Did you know that you should be reversing your ceiling fans when the temperatures switch? During the warmer months, your ceiling fan blades should be turning counterclockwise. This direction moves cooler air downwards. But in the winter, remember to switch your blades to turn clockwise. Warm air naturally rises, and this movement causes the warm air to return down to your living space. Look around your apartment for a second. How many appliances and devices do you have plugged in that aren’t currently in use? Many of those devices still draw power even if they are turned off or in a sleep mode. Taking a few seconds to unplug your devices when they aren’t in use can save you some change on your electric bill. And, the more devices you unplug, the more money you save. If unplugging each device sounds like a lot of work, invest in a few power strips. You can then turn one switch off on the power strip and it will prevent all appliances plugged into it to stop drawing power. The best part about this trick? It saves you money on your electric bill during all seasons! Now that you know more about helpful ways to lower your electric bill, you can start saving cash this winter. You’ll be amazed at all the money you can save by implementing just one or all of these tips. Start small by lowering your thermostat, reversing your ceiling fans and unplugging appliances. Once you’ve adjusted to those changes, consider insulating your apartment’s doors and windows. Interested in more apartment-living tips? Check out our blog! It’s a new year! And maybe you, like many others, have made the goal to declutter your apartment. If you’re not sure where to begin or how to make the cleanliness last, read on for the top 3 professional tips on how to get rid of clutter for good. Clothing is best organized by the owner in one sitting. So we recommend setting aside an hour to organize it. Grab a few garbage bags. You’ll want one for clothing that you can donate, and one for other clothing that isn’t donatable (used underwear, damaged clothing) that you can recycle through a fabric recycling program. In the U.S. over 13 million tons of fabric ends up in landfills each year, so no matter what condition it’s in, recycle it! If you live in a place where you experience seasonal changes, then it’s also a good idea to have a large, clear Tupperware container and lid with you. Does this item of clothing bring me joy? Does this item of clothing provide me peace? If the answer to any of those questions is “no” then you place it in either your donation or recycling bags. If you come across clothes for another season than the current one that you’re keeping, fold them neatly and place them in the Tupperware container. When the appropriate season comes again, you can place the passing season’s clothes inside. Many people express before beginning a decluttering mission that their space is overwhelming. And it’s hard to know where to start. If you feel this way, then we’ve got a trick for you. It’s called the 10-minute trash routine. Get 2 trash bags (one for garbage, one for donated items) and start at one end or corner of a room. Set a timer for 10 minutes and spend the entire 10 minutes sorting items into one of the trash bags or a keep pile. After your timer goes off, immediately take out your bag of garbage. And place your donation bag in the room you’re decluttering. You can continue to use that for donation items through the week. Before you leave the room, take the items in your “keep pile” and put them away in their designated spots. Repeat this routine at least once a day. Pick a day of the week to deliver your donatable items to Goodwill, a local charity, or another thrift store. Continue to donate items once a week. Making the 10-minute trash a routine is a small way to make a big impact on your overall cleanliness. A lot of clutter that happens around the house is a result of mail, bills, and other miscellaneous papers. A pro decluttering tip is to switch to paperless bills, statements, etc. Think through your property utilities like rent or mortgage, water, garbage, gas, electricity, sewage, etc. Find out which of these you can manage through auto pay and paperless billing. Next think of other reoccurring expenses like a phone bill, loans, internet, credit card payments, car payments, streaming services, etc. All of these bills should allow for paperless billing. Set up an email account that’s exclusively for paperless billing emails so you don’t miss any payments. With less paper clutter in the house, it’ll be easy to sort through junk mail and send it straight to the recycling bin. Now that you know how to get rid of clutter, it’s time to get started. Choose one of these ideas to start with today! Need more help decluttering your apartment? Check out this article on unique bedroom storage ideas. New Year’s resolutions always start off with the best of intentions. Yet by February, 80% of people will have broken their resolution already. So what’s the solution? Set more manageable goals, of course. If you’re looking to make the upcoming year your best one yet, start with your apartment. Here are some of our favorite simple new year goals for your apartment. The holidays tend to be the busiest time of the year. As a result, typical chores like taking out the trash, clearing dishes, and picking up clothes tend to fall by the wayside. Hey, we’re not here to judge — everyone’s space could be a little cleaner. But cleaning up is so much more than a way to feel better about how your apartment looks. It can help you set your year off on the right foot, as well! Psychologists found that cluttered spaces have a negative influence on our overall perceptions and even affect happiness. So if you’re looking to have a happy new year, complete a few simple chores. Not only will your apartment look better, but you’ll be happier and healthier to boot. It’s hard to beat the convenience of take-out. But too much of a good thing can hurt your wallet. Analysts discovered that Americans spend over $3,000 per year on dining out. What’s more, 50% of respondents said that they hated to cook. It’s time to put that apartment kitchen to good use. Even if you can’t stand cooking, making an effort to cook more and order less is a fantastic way to save money. And not only will your wallet thank you, but you’ll have the opportunity to learn more about the culinary arts. You may even discover that cooking is a passion of yours after all! New Year’s resolutions often revolve around change. And changing your living space is a great way to kick things off. Best of all, you don’t even have to move to enjoy a refreshed living space. Start off the new year by rearranging your apartment. There are tons of creative ways you can make the most of your space, even in a studio apartment or single bedroom dwelling. Most of us have a set daily routine. We get up, go to work, come home, and repeat until the weekend. While that’s enough to keep the lights on, it doesn’t sound like a very fulfilled life. In the upcoming year, take advantage of the diverse group of people in your community and make an effort to be more social. Introduce yourself to your neighbors and focus on meeting new people. Attending resident parties is a great way to get to know your neighbors so make a plan to attend some in 2019. Another way to be more social with your neighbors is through social media! Like your https://www.facebook.com/montrosesquareapartmentsapartment community’s Facebook page. This is a great place to not only interact with the community team but other residents as well! You’ll be happier, less stressed, and you’ll have a whole new group of friends to spend time with. Setting new year goals can be an exciting way to start your year off right. So if you’re ready to make some changes, be they small, like cooking more, or big, like rearranging your living space, set these goals for a great new year. If you’re hoping to start the new year off in a great new apartment, get in touch! Americans have filled over 36 million square feet of self-storage units. And that number continues to rise as we buy more naturalistic items than we have space for. If you’re already paying rent, why pay for a storage area too? Instead, get rid of what you don’t need then take advantage of the available storage space in your apartment bedroom. Here are five unique bedroom storage ideas to help you make the most of your apartment’s space. One of the most underused spaces in your bedroom is under your bed. Instead of shoving dirty clothes under your bed when you have guests come over, utilize this bedroom storage space wisely. Use this space to store your off-season clothing. Purchase some clothing vacuum storage bags to make room in your closet without taking up a lot of space under the bed. You can also use these bags for spare sheets, towels, and blankets. Consider other storage bins for your less frequently used items. Then use a bed skirt to hide all of this storage away. One of the best small bedroom storage ideas is finding several uses for your bedroom furniture. Instead of a simple bedside table, invest in a nightstand with drawers. Use the top of your dresser as a vanity to store your accessories and makeup. Like the look of an ottoman or bench at the end of your bed? Make sure it has storage space inside. If you’ve already downsized your belongings and still need more storage space, try using closet organizers. Make sure you are taking advantage of all the space in your closet by using shelving in addition to hanging space. An organized closet allows you more storage space and helps keep everything easy to find. Looking for small bedroom hacks for storage space? Try a wardrobe wall or rolling closet. Wardrobe walls and rolling closets allow you to store your clothing outside of your closet. Rolling closet racks are best if you have a small wardrobe that won’t clutter your bedroom area. Wardrobe walls work well if you have a lot of clothes that are best hidden behind doors or in drawers. When you free up your closet, you can use that as a large storage space. Drawer and shelf organization is another DIY bedroom storage solution. Take the time to learn how to properly fold your clothes to maximize space. You’ll be surprised how much more space you have when your clothes are properly folded. Use dividers and storage boxes to keep things other than clothes organized. There are plenty of storage box designs these days to fit with every bedroom decor. Now that you know all about the best bedroom storage ideas, it’s time to discover storage space in the rest of your apartment. Check out this article for ways to make extra kitchen storage space. Looking for a spacious apartment in the Fort Wayne area? Contact us today and take advantage of our different apartment offerings. It’s Christmas time! That means everyone is decorating their homes with greenery and sparkling lights. But when you have an apartment, decorating is a little harder. Leasing managers don’t take too kindly to putting holes in the wall, even if it is for stockings and Indiana fire code doesn’t allow fresh cut Christmas trees in apartments. But, just because you live in an apartment doesn’t mean you have to give up the Christmas spirit. There are still plenty of ways to get festive without jeopardizing your deposit. Get ready for the holidays with these six apartment Christmas decoration ideas. Suction cups and temporary adhesives are your apartment decor saviors. Suction-cup hooks can help you with putting lights up around your windows. There’s a small chance they’ll fall down. The great thing is you can put them back up in a second. Temporary adhesive hooks are also perfect for apartment decorations. You can stick them on your wall and take them off without damage. Make sure you have a plan for where to put them. They only work once, so you need to save them. Replace your decor with Christmas-y decor. Nutcrackers, snowmen, or nativity scenes will get you in the Christmas spirit. Decorate Window sills, tables, and unused counter-space a with festive ornaments. You can even fill glass bowls with colored bulbs for an easy Christmas decoration. The past two years have been the years of hygge. It’s a Danish term that means “cozy,” and it’s the best thing to happen to your holiday. Hygge encourages adding cozy things in Winter, like big plush pillows and blankets. Buy some cute Christmas pillows and you’re ready for a great holiday season. Even if your apartment decorations are lacking Christmas cheer, a few candles change that immediately. Clusters of big white candles create a friendly atmosphere for the holidays. If you’re worried about having that many candles, get flameless LED candles. They’re perfect for displaying and you don’t have to worry about them getting knocked over or forgetting to blow them out. Do you enjoy seeing all of the houses around Fort Wayne with Christmas lights? Lights are a great way to add that extra holiday spirit. Lucky for you, there are Window Wonder Frame Kits. These kits fit your windows and hold your lights up all season long. Installation is easy, and you’ll have the cheeriest apartment in the building. 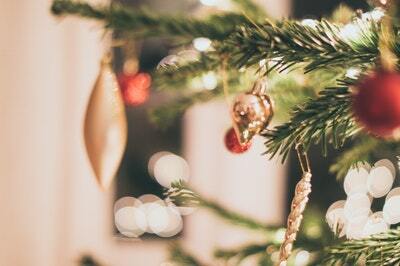 The easiest way to make your apartment decorations festive is to find a tree. While Indiana fire code doesn’t allow real Christmas trees, you’d be surprised at how real artificial trees look, plus you won’t be stepping on hidden pine needles in July! Small artificial trees are great for apartments. They don’t take up as much space, there’s less to decorate, and they fit perfectly on an end table. Add a strand of lights and your family ornaments. You can even put gifts under the tree for friends and family! Looking for an Apartment to decorate in Fort Wayne? You need an apartment for all these apartment decorations! If you’re in the Fort Wayne area, Montrose Square Apartments is perfect for you. We’re close to shopping, dining, and entertainment and a short drive from anywhere you need to go around town. Your family will love to visit you during the holiday season, so apply today! Whether you’re moving across the county or to an entirely new state, you’ve got some research to do. Finding the right place to live is crucial to whether you’ll like your new city. You’ll want to start by considering which area of town you want to live in, then begin looking into apartment communities in that area. You’ll find a nice selection of facilities across the city to match every demographic. Let’s talk about how to find that perfect Fort Wayne apartment. The web is how we all do business. You already turn to Google to find restaurants and stores, so why not a new apartment? Simply search “apartments in Fort Wayne”, “apartments in North Fort Wayne”, or “apartments near me” and you’ll come up with a lot of great options. Visit the different apartment community websites to view photos, tour their community, and get rental rates. The best type of advertising is the one that’s done for free. Word-of-mouth travels far. People do not shy away from sharing any nightmare – or positive! – rental stories they’ve had. If you know anyone in the area or can get in contact with someone directly, start there. If not, there are a plethora of forums to provide you with insightful information. Again, a simple Google search can help you retrieve tons of reviews on a place. Look for communities with at least a 3.5.-4 star rating. Oh, and listen to the bad, too. The only way to truly get a feel for an apartment is to see it for yourself. It may seem like the greatest facility online, but be a total mess in person. When you’re in your research stage, don’t just limit yourself to one apartment. Make a list of several prospects you’re interested in checking out and then contact their leasing groups. Pay attention to how management handles your requests. If you notice they’re slow to respond or unfriendly, move on. This is a clear indicator of how they would treat you if you did sign a lease. Once you’re on your tour, make sure to ask about extra costs and to see all the amenities. Moving is a stressful, yet exciting task, no matter where you’re coming from. You can guarantee a smooth transition by working with the right apartment community. If you’re looking for a Fort Wayne apartment that goes beyond the ordinary, you’re in the right place. Montrose Square Apartments is nestled into a beautiful landscape setting near shops and the freeway. Contact us today to tour your new home!